"Cadolzburg" was first mentioned in a document in 1157. In the mid-13th century it was acquired by the Hohenzollern burgraves of Nuremberg. The oldest stone buildings known to us date from this time; during the following centuries these were extended to create a prestigious complex. When in the 14th/15th century the Hohenzollerns came into conflict with the city of Nuremberg, they made Cadolzburg their centre of government in Franconia. After the court was relocated, the castle continued as an important administrative centre of the Brandenburg-Ansbach margraviate until the end of the 18th century. The main castle, perched on a steep rocky spur, is surrounded by an imposing ring wall, which like the main gate and Palas (part of the New Building) dates from the 13th century. Outside the ring wall is a spacious bailey, where the Burgmannen originally resided and which in the Renaissance period became a garden. At the end of the Second World War the castle went up in flames and remained a ruin for decades. Over the last few decades the Bavarian Palace Department has secured the site and the building substance. Cadolzburg Castle today houses the exhibition “A castle and its lords. The Cadolzburg experience” with an exhibition area of around 1,500 m², which provides an entertaining and exciting encounter with the Middle Ages. 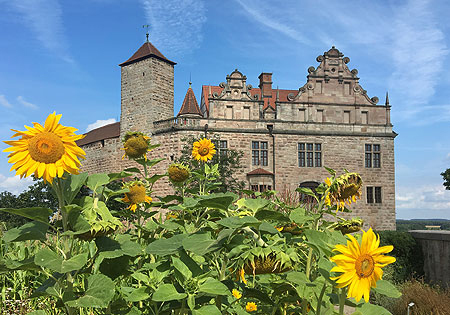 Visitors are able to see, hear, smell and feel what it was like to live at the castle in the late medieval period and gain an immediate impression of the past. The Oriel Hall and Oak Pillar Hall are suitable for receptions, concerts, lectures and banquets up to 150 persons. The New Palace is suitable for receptions and concerts up to 390 persons. It is an approximately 20-minute walk from the station to the castle.